People who attended or listened to (on MBR Radio's MESN presentation on 1310AM NewsTalk WLOB) the So Portland Red Riots game against Thornton Academy Boys Saturday afternoon were treated to quite possibly the best basketball game in Maine in years. After a back and forth battle, where So Portland trailed by as much as 19,, the Red Riots prevailed in 2OT 82 - 78. Both teams came out blazing, trading 3 pointers highlighted by a couple back to back 3s by Thornton's Andrew Shaw and South Portland's Vukasin Vignjevic. Shaw, who has had 27 first half points, made up for the absence of Trojans' top player James Ek (DNP, Coaches decision). After a close 1st, TA pulled away in the second quarter, building a game high 19 point lead to close the half. South Portland head coach Phil Conley needed answers at half time, needing to know "what type of we are? Are we going to hang our heads...or are we (going to) dig tough..and get back into (this game)". His team answered immediately, taking 5 points off the Trojans' lead in the first 2 possessions of the 2nd half as Tanner Hyland drained a 2 and a 3 quickly. The Riots closed the gap to just 9 after 3 behind Hyland, Vignajevic and a strong defensive effort by Logan Gaddar on TA's Shaw. South Portland saved the best for last, as they stormed all the way back, taking a 61-60 lead with a little more than 4 minutes left. Jordan Muller contributions for the Riots can not go unnoticed, nailing free throw after free throw. Muller finished 16-18 from the charity stripe. The Riots actually built a 4 point lead with a little over 1 minute to go in regulation, but Thornton's younger Ek, Adam, drove strong to the hoop and got fouled on a lay up that was good. Ek missed the freebie, but Thornton gathered an errant SP pass, got the ball to Justin Pollard to tie the game at 68 with 47 seconds to play. The Riots tried to hold for the last shot, in between a few timeouts, but could not finish it in regulation. Tanner Hyland was able to get the ball to Logan Gaddar for a fade away as time expired, but the ball bounced front and back rim before falling off the rim. Regulation ended deadlocked at 68. The two teams traded free throws and a basket apiece, before Jordan Mullar free throws put SP up by 3 with a 50 seconds left. Ek drove hard to the basket for the Trojans, missed, got his own rebound, fed Pollard for a three. Pollard's shot front rimmed and Andrew Shaw grabbed the rebound deep at the top of the 3 point line. Shaw went right with the Riots' Gaddar right on him, and launched an deep three that banked high off the glass for the miracle game shot, tying it at 73. The Riots were able to get the ball in the hands of their leader, as Vignjevic got to the hoop, laid the ball up, but would not fall through the twine as time expired, heading to double OT tied at 73. After grabbing the early lead, South Portland turned up the heat on D the rest of 2OT. Ek and Shaw threw up wild shots, forcing TA to foul. Unfortunately for TA, Jordan Muller was the Red Riot that had the ball in his hands. Muller drained all except one to put the Riots up 80-75 with a few seconds left. Andrew Shaw, who finished the game with 46 points, tried ti will his team to victory with a deep, NBA style 3 to close the gap to 80-78. After a timeout, TA was forced to foul Muller again, this time putting the game away, nailing 2 freebies with 5.5 seconds left. 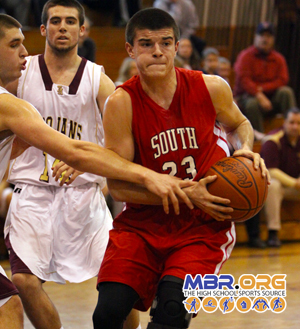 South Portland escaped with a 82-78 win. Thornton's Andrew Shaw finished with 46 points and South Portland's Vignjevic netted a team high 31.